FamFest is a multiple day event to bring outcasts together. It’s a weekend to prove that supporting bands in the heavy music community makes a difference. 2018 would be it’s second year held in Philadelphia. With the infamous Vans Warped Tour coming to an end, FamFest would now be the place for bands that want to network and make connections. I was hired by the promoter to design a flyer that would make a statement that all are welcome and elevate the event’s unique appeal. 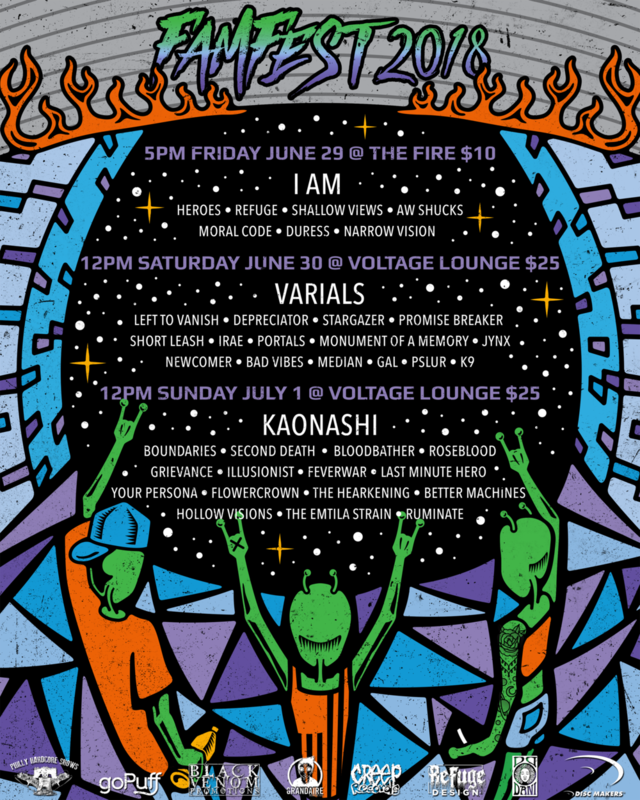 FamFest would be held at two venues: at The Fire and at Voltage Lounge in Philadelphia. With aliens as the suggested inspiration for the people, I started to brainstorm the overall experience at a show as it’s own “universe”. I used familiar venue elements like the famous pattern outside of Voltage Lounge and their huge metal garage door as the setting. I designed each alien character to be diverse enough to represent all types of people in the heavy music community. The entire scene was illustrated in a circular skew that revolved around the stage which held the festival’s information. With over 40 bands playing over three days, I had to position the type to showcase the correct date, time, place, price, headliners, and supporting bands on each day. To ensure the viewer can obtain all the information and appreciate the design at the same time, I stuck with a simple color palette. The flyer was well received with over 88 shares to the original flyer post and countless reposts to band pages and show goers. The event had a great turn out with over 500 people enjoying themselves. The flyer was printed into a laminate for people who purchased the three day ticket pass and for all band members to wear. It was also printed into a poster for people who wanted to take their memories home with them. The event was a huge success and lived up to it’s expectations.